Today marks the start of World Doula Week, where we focus on the work doulas do to improve the social, emotional, physiological and psychological wellbeing of whole families. From pregnancy, to birth and then to the postpartum period, doulas take care of their clients. 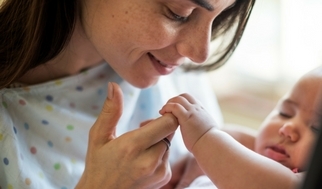 For most doulas, it feels like a calling or a passion that sparks a career. It takes a heart of service and usually a story about why we decided to become a doula. My story started one way and had a pretty big plot twist. I became a doula in 2010 because I loved studying everything about pregnancy, birth and babies in college. My “why” was a passion for everything I was learning about birth and babies in my undergrad internship at a birth center in Denton and a natural ability to support others. I was the person who my friends and family came to for advice about pregnancy, birth and breastfeeding and it felt like a natural career choice. Here comes the real #TBT though…back to 2012. I had been a doula for 2 years and was working as a newborn nanny. I had a car accident and herniated two discs in my back worse than I knew. After a night in the ER for pain and subsequently losing the feeling in my legs and ability to walk altogether, I was admitted to the hospital. For 5 days, I laid in a hospital bed not knowing if I would walk again or if the pain in my back would ever go away. My mom and roommate (turned rock star postpartum doula), Samantha were there with me when the spine surgeon came in to tell us a 360 2-level spinal fusion was my option to regain function in my legs. Through that surgery and the life-threatening complications that followed, I learned what truly nonjudgmental support can do for healing. For 37 days in the hospital, my mom, my friends and my nurses and doctors safeguarded my dignity, listened to my fears, reassured me and respected my wishes. They trusted me to make the best decisions for myself. Shoutout to all of the nurses on the med-surg unit at Texas Health Presbyterian Flower Mound. I had nurses lift me into wheelchairs and hold me on toilets and in showers, so I didn’t have to use a bed pan and could bathe myself. I had a certified nursing assistant French braid my hair because it had been a knotted mess for days. My mom listened and got me every snack I wanted when I cried and cursed in pain and frustration. She held my hair when I got sick and patted my leg when neither of us had the words to describe how scared we were. She put on a gown and mask to be there while they placed a picc line in ICU, never leaving my side. Samantha held my hand all night, so I could sleep through the hallucinations from my pain pump and helped me laugh again…and again. My surgeons fixed my spine and then went on to save my life. They answered every question, gave me a realistic idea of my new normal and had my back, literally and figuratively. I went into doula work because I loved birth and babies, but I’m still in doula work because I now know the difference nonjudgmental support can make. I remember how I was treated through one of the most intense experiences of my life and I want to give that same level of care to each of my clients. When you’re at your most vulnerable, you deserve the very best support and that’s my “why” as a doula. Having a scheduled cesarean section can be just as overwhelming as an unplanned or emergency cesarean. There is so much excitement when your baby is born, but there can be just as much anxiety and fear when you’re headed into surgery. Although cesareans are the most common surgery performed on women in the U.S., they are still major abdominal surgery and that can make learning to breastfeed and caring for a newborn challenging.